Introduction | What is WIC? | Income Guide | Breastfeeding | HealthBites | eWIC | Forms | Locations | WIC Works! Being pregnant or breastfeeding a baby is a big job. The Special Supplemental Food Program for Women, Infants, and Children (WIC) can help. The objective of the WIC Program is to prevent the occurrence of health problems and improve the health status of those served. The WIC Program can help pregnant, breastfeeding or post-partum women, infants, and children in low income or no income families. WIC will provide, at no cost, nutritious foods to supplement their diet, information on healthy eating and referrals for health care. WIC provides benefits for these participants during critical times of growth and development. WIC teaches them how to choose and prepare nutritious and affordable foods. An applicant must qualify financially and nutritionally to receive WIC benefits. In order to determine eligibility, the applicant must provide proof of income and have a gross income within the income guidelines set by the USDA. Medical referral forms are available at the WIC office for completion by the medical facility. If medical information is not available from a medical facility, the applicant’s height, weight, and blood-work will be completed at the WIC office at the time of the appointment. For more information, please call (757) 518-2789. WIC is a special supplemental nutrition program for women, infants, and children sponsored by the United States Department of Agriculture. WIC helps pregnant women, post-partum and breastfeeding mothers, infants (newborn – 11 months) and young children (less than 5 yrs.) stay healthy and eat right during times of important growth. Our mission is to work with communities to provide nutrition and health information, resources, and support to encourage choices for healthy living. Rent of mortgage receipts, etc. Enrollment in TANF, FAMIS, Medicaid, SNAP/Food Stamps, Free/Reduced Prices Lunches automatically qualify with proof of enrollment. 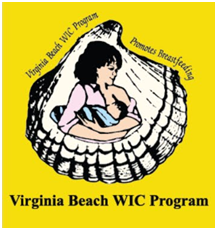 Virginia Beach WIC Program actively promotes breastfeeding. A Breastfeeding Helpline is available 24 hours a day. Please call 757-284-9428 with any Breastfeeding concerns or questions. Peer Counselors are available at each WIC site to provide support and information to pregnant and breastfeeding clients. Breast pumps are available to WIC moms that will be returning to school or work. Breastfeeding Classes are held monthly at each site. Exclusively Breastfeeding moms on WIC also receive an extra bonus of additional fruits, vegetables, cheese, beans, fish and whole grains on their WIC food benefits. The Virginia WIC Program has gone paper-less!! 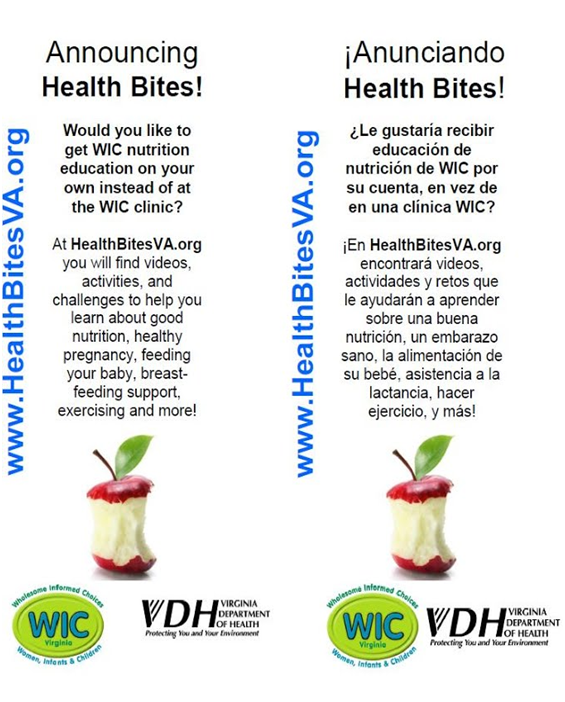 The Virginia WIC Program eWIC card will be replacing with the paper food instruments (vouchers). Conversion to the new Crossroads system was implemented in Virginia Beach on March 3, 2014. Clients are being transitioned to the new eWIC EBT cards when they attend their Nutrition Class or Certification appointment. The family’s WIC food benefits will be automatically credited to the eWIC card account. The card can be used at stores displaying the ”Virginia eWIC Card Accepted Here” sign. Using the eWIC EBT card will speed up the process at the register. It will eliminate the need for a store manager approval on WIC purchases, which was required at many grocery stores, when participants cashed their paper food instruments. For more information about the eWIC EBT cards see the FAQ sheets below. For convenience, there are 4 WIC clinics in Virginia Beach.